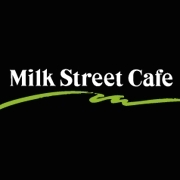 Milk Street Cafe first opened its doors in Boston on November 21, 1981 and has been proud to serve the finest house made foods ever since. Milk Street Cafe is an upscale casual restaurant and one of the premier corporate caterers in Boston. Milk Street Cafe is known for an unmatched commitment to beautifully prepared, delicious, healthy and wholesome foods as well as our famous Brownie Points Program.